As with the workshop, the blog posts this week and next week will draw together principles linked to learning science research findings, and practices drawn from concrete strategies reported in scholarship of teaching and learning. This week we focus on Motivation Requires Us All (#4) and Goal Has Value (#1). We do not remember what it is like to not know what we are trying to teach. In Preparing Future Faculty courses, we regularly ask participants if they remember – at all, at all accurately – how they came to become engaged in learning about topics that they now passionately pursue? Do they remember how they participated in class from which they felt disconnected, and how their “smart but not going to pursue this as our life’s work” peers participated in class? Did they and their peers then actually take on the learner roles and responsibilities that they now expect students to pursue in courses they will teach – now or in the future? To think about openly and deeply about motivation we begin with this remembering of how we have experienced learning and how we have observed our peers (including family members and friends working beyond the academy) as learners. From this we can move on to think about motivation as involving three agents or agencies: learner, teacher, and the creation of knowledge. What does the teacher brings and do? We can motivate. That is, we can “stimulate someone’s interest or enthusiasm for doing something,” we can encourage, activate, influence, and sometimes push. 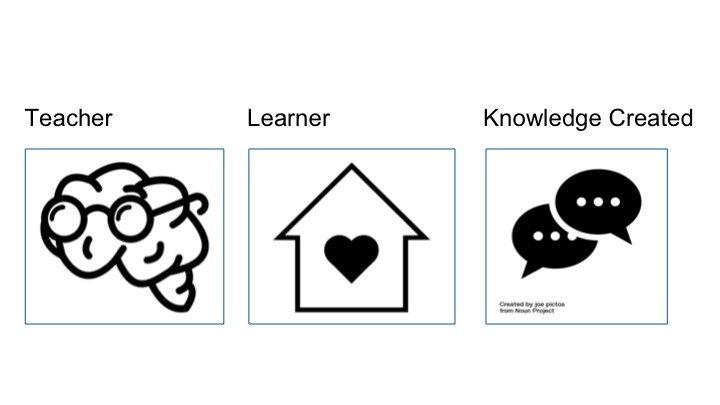 What does the learner brings and do? Students bring and discover motives . Motive is something “already in motion, something brought forward, reason for doing something.” Motive is linked to intention, provides a basis, and sparks purpose. What do we – teachers and learners – do together? In both roles, we create, generate, launch motivation. Motivation is informed by the reasons one has for acting or behaving in a particular way. Motivation sparks our willingness to risk something new, animates our willingness to work harder. In general, people are motivated to work towards a goal (in our case learning in a course context) when the goal has value to them. Those goals might be performance oriented – getting a good grade, doing better than peers, not looking bad; or they might be learning oriented – making use of feedback and activities to gain competence, engaging in new practices that can be used elsewhere, wanting to know more about a subject that is personally significant. Value is enhanced when students perceive goals as having an important purpose in their learning and/or in their living. While purposes including mastery of a skill, and completion of a requirement linked to a future role (advanced standing in a major, career aspiration, or community/culture affinity) can be important to both learners and teachers, James Lang suggests we focus on “infusing learning with a sense of purpose, and especially self-transcendent purpose” in order to “tune the attention of learners to things that matter,” This purposeful focus “drives our attention toward certain things and drives it away from other things.” Attending to the practical and deep purposes of our courses – given the frames of colleagues in our fields as well as past and current students in our courses – helps student to fine-tune their motives, and teachers to more finely develop activities and assessments that motivate learning. Create a learning syllabus as describe within the Parkes & Harris article “Purposes of a Syllabus” with a narrative that engages purpose and emotion, that shows students how the pieces of the course work together, and that points them in the direction of people and places they can seek out with learning questions and difficulties. Asking students in an upper division course to name this personal learning goal, the teacher charted a summary of the whole group’s interests, then throughout the semester, linked those interests to relevant lectures, discussions, or inclass activities. Students’ engagement was enhanced both via the personal recognition and the increased awareness of classmates’ interests. Another teacher made use of goal statements on index cards to pair students for collaborative writing assignments as part of an introductory course. In this context, the students had different interests and were required to develop a third way of framing their response to a given question, rather than to debate pro and con possibilities of dualistic thinking. Another teacher drew on a collection of student goals during one-to-one paper-development conferences (and in larger courses, topic-oriented small group conferences) to help students develop working thesis statements, strategies for research, and networks for sharing research sources. Finally, in both introductory and advanced level courses, one teacher asked students reflect on the goals/outcomes written into the syllabus by naming one strength the student brought to the course that would help her meet those goals, and then identifying one way that same student would need to stretch in order to meet the stated goals. In a follow up question, students were asked how they could use strengths to support others, and what would incline them to seek out support in places requiring a stretch. Again, with the overarching purpose of growing learning in mind, the teacher made use of the data to shape ad hoc groups, formal teams, and to select resources (human, print, online) for students to consult based on named difficulties. Linda Nilson. “Motivating Your Students” in Teaching at Its Best: A Research-Based Resource for College Instructors. John Wiley & Sons, 2010: 51-59. James Lang. “Motivation” in Small Teaching: Everyday Lessons from the Science of Learning. Wiley, 2016: 167-193. 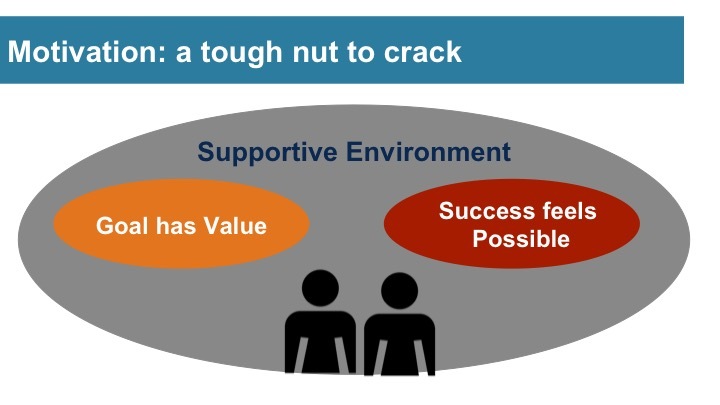 The slides for these two segments of the Motivation presentation include links to further resources in the Notes field. We’ve also posted to Google Drive our starting out brainstorm listing of strategies aimed to Increase Value.